The Sand Castle Inn resides on La Salle Ave in the quiet town of Seaside, California. 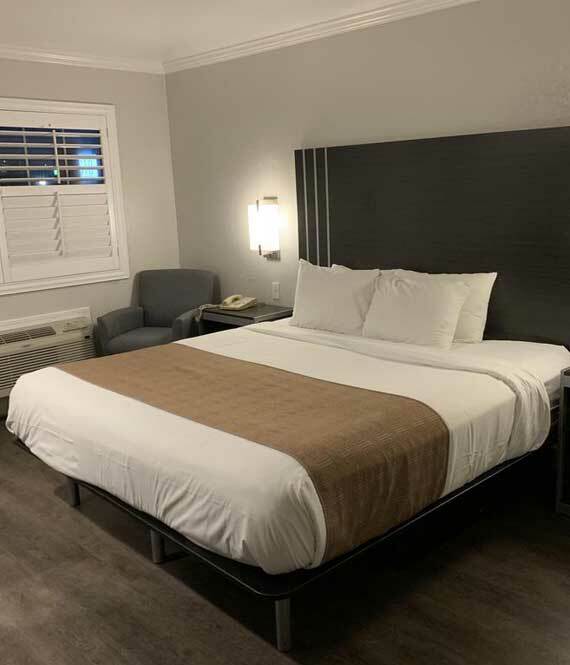 We are located 7-minutes from the Monterey Regional Airport, and just over one hour from the San José International Airport, and under two hours from the San Francisco International Airport, and Oakland International Airport. Our guests appreciate that we are adjacent to the Costco Sand Dollar Shopping Center. There is a wide variety of restaurants within walking distance of the hotel, and we are three minutes away from Sand City Beach, as well as Monterey State Beach and the paved Monterey Peninsula Recreational Trail. Our location is easily accessed from nearby Cabrillo Highway 1, and we are minutes away from top Monterey attractions. The Sand Castle Inn is pleased to offer guests complimentary WiFi, complimentary self-parking, non-smoking rooms, vending machines with a variety of beverages, non-smoking rooms, guest laundry facilities, express check-in, and check-out, a helpful and friendly 24-hour front desk, and wake-up service. We also provide a designated smoking area. Seaside, California offers visitors to the area the convenience of an ideal location, beautiful beaches, and plenty of attractions. Our hotel is near Bayonet & Blackhorse which provides a world-class golf course, and Fort Ord National Monument Park is minutes away. The quiet town of Seaside is minutes away from the Monterey Bay Aquarium, 17-Mile Drive in Pebble Beach, Cannery Row, and Pacific Grove. Exciting nightclubs, wine tasting rooms, landmarks, top restaurants, and exclusive boutique shops are minutes from the hotel. At the Sand Castle Inn, our guest rooms are fitted with modern décor and lifestyle amenities with a focus on guest comfort. One look and you will understand why guests prefer our Seaside, California hotel. We are proud to offer our guests amenities like complimentary WiFi, express check-in and check-out, a helpful 24-hour front desk staff, wake-up calls, guest laundry facilities, and non-smoking rooms. Let us be your host while you visit the Monterey Peninsula. Our Seaside hotel is within walking distance to Sand City Beach, as well as Monterey State Beach and the paved Monterey Peninsula Recreational Trail. Additionally, top Monterey attractions like the Monterey Bay Aquarium, Cannery Row, 17-Mile Drive, the Wharf, and exclusive boutique shops are a short drive away.